The Laguna Beach Business Club proudly presents attorney Gail Allyn Landau, founder and owner of Catmosphere Laguna, Orange County’s first cat café, as speaker at the club’s meeting this Thursday, April 18. For more information about the club or to register to attend this Thursday’s meeting, visit lagunabeachbusinessclub.com or email Info@LagunaBeachBusinessClub.com. We’d love to include yours – and/or your children’s birthdays here. Pageant of the Masters at Festival of Arts is proud to once again provide the opportunity for patrons to gift tickets to the world-famous performance of “living pictures” to local nonprofits with the Masters at Giving program. Since 2011, the Masters at Giving program has donated over 12,000 Pageant tickets to charitable organizations in the Southern California area. Give the gift of an unforgettable experience at the 2019 performance of “The Time Machine” today by visiting www.pageanttickets.com. Or, contact Anne Mai at (949) 464-4210 or via email at Anne.Mai@foapom.com for more information. Masters at Giving offers the opportunity to purchase a group of 10 to 100 tickets in the Director’s Tier Side section at $25 each, which will in turn be delivered to a charitable group on the approved list. The charitable and nonprofit groups include veterans, senior centers, at-risk youth and women’s groups, outreach organizations, arts students, military families, food banks, mentoring programs and many more. The Pageant of the Masters will run July 7 - August 31with tickets starting at just $15 per person. The 2019 Festival of Arts Fine Art Show runs in conjunction with the Pageant and will take place July 5 - August 31 with general admission tickets starting at $10 per person. A Pageant Ticket also acts as a season pass to the Festival of Arts Fine Art Show. For more information on Masters at Giving, Pageant of the Masters and Festival of Arts, visit www.PageantTickets.com. First of all, to clear up any misconceptions, this is not Matthew Pike of the now defunct Beach House. Same name, different guy. As of two weeks ago, this Matt Pike is the new Executive Chef of the Royal Hawaiian. He brings a wealth of experience to the table, in more ways than one, and a singular vision to bring back the old days of the Royal Hawaiian. And who in Laguna doesn’t yearn for that? They’ve recently added brunch to their menu, and Pike says that they just hosted a wedding celebration of 14 and emphasizes that it’s a great place to have birthday or anniversary parties. Additionally, theme nights and industry nights are in the works. How Pike ended up at Royal Hawaiian involved racking up some pretty significant culinary miles. And aptly, along the path, he spent 15 years in Hawaii as a chef, so he knows of what he speaks (and cooks) when it comes to island inspired food. His lengthy resume is ridiculously impressive and began many years ago a long way from Hawaii. In the early ‘80s, Pike landed in Laguna, but unfortunately, on his first night here, he was held up and robbed. The next day, he got a job at Dana Trader’s in Dana Point, and then here in town at Main Beach Bar and Grill (current location of the lifeguard headquarters). Along the way, in 1984, he met his wife Dede Westgaard, a graduate of Laguna Beach High School, who is currently a realtor with Coldwell Bank. The Main Beach lifeguard stand was named after her father Dean Westgaard, a lifeguard for 17 years. The couple moved to Kona, Hawaii, and he continued his career working with Alan Wong at Canoe House Restaurant, Kona Village. Soon he was executive chef at King Kamehameha in Kona Beach, and then at The Ritz Carlton, first in Maui and then Palm Beach, Florida and South Carolina. After that, he traveled to Atlanta for a gig with The Golf Club of Georgia, and a year later, they came back to California. Pike and his wife have now been married 30 years and have three sons (the youngest went all four years at LBHS). Not surprisingly, each is involved in some phase of the food business. Dylan works with his dad at the restaurant, Carter is a banquet captain at the Four Seasons in Hawaii, and Kailar, who lives in San Francisco, works in a gourmet deli-burger shop. With Pike at the helm, it’s bound to happen, and sooner than later. The Royal Hawaiian is located at 331 N Coast Hwy. For more information, go to www.royalhawaiianlb.com or call (949) 715-1470. For more information on Food Pantry, go to www.lagunafoodpantry.org. On Tuesday, April 30 at 3:30 p.m., Laguna Art Museum and Newport Beach Film Festival will co-present the film Citizen Lane at Edwards Big Newport 4. Citizen Lane documents the Irish art collector who created the first known public gallery of modern art in the world. Irish art collector Hugh Lane created the first known public gallery of modern art in the world. Through an innovative combination of drama and documentary filmmaking, this documentary paints a vivid picture of Lane and the various challenges he faced on his journey. Tickets are $16 and can be purchased at www.newportbeachfilmfest.com/citizen-lane. Edwards Big Newport 4 is located at 300 Newport Center Dr. This year’s theme is “Freeestyle”. All ages are welcome. Winners in all categories. Prizes are $25 - $100 Gift Certificates. Submit up to three original poems (each poem must have a completed copy of this form attached). You must include your name, address, phone or email, grade level (or “Adult”). Return to Laguna Beach Library or email to ocpl.lagunabeach@occr.ocgov.com. After the successful Bedtime Math: Crazy 8s program, the Laguna Beach Library designed a series of fun math activities for kids K-2nd grade. Kids can read aloud to the library’s therapy dog, Mike. He’s so sweet and a very good listener. Bow-Wow! Preregister at the Service Desk or call the library. Drop-ins welcome, too! Stories are important. That’s why the library has combined story time with technology to introduce Techy Story Time. The program combines iPads, Apple TV, and occasionally the 3D printer to make it fun and educational. Come view the timeless movie classic Citizen Kane, considered by many to be the finest film in cinematic history. Theo will be talking about the film, and there will be a full viewing after the talk. Welcome to the Peapod Academy. Join some of the cutest babies, toddlers, and preschoolers in town and adults of their choice at the Library. Little peas will enjoy books and story time, songs and music, finger plays, movement, hands on activities, arts & crafts, and other cadets. Each week has a different theme. Get to know others and support your little one’s developmental skills. No preregistration required. Get creative and let your imagination run wild! Children under 12 are encouraged to come to the library during the hours of 9 am to 3 pm to make fun and creative seasonal crafts. Adult supervision is recommended. Participants should bring 10 copies of a poem they wish to have read and workshopped. Each poem will be read by the poet and perhaps by another reader. Participants then respond with emphasis on positive comments and constructive suggestions. Recommended for advanced poets – this is not a workshop for beginners. The group meets in the Community Room. Contact Mike Sprake at (714) 318-1461 or by email at mikesprake@gmail.com for more information. On Thursday, May 2, Laguna Beach Interfaith Council presents the organization’s 12th annual “National Day of Prayer” from 8:30 - 9:30 a.m. at Mission Hospital. On April 17, 1952, President Harry Truman signed a bill proclaiming the National Day of Prayer into law in the United States. President Reagan amended the law in 1988, designating the first Thursday of May each year as the National Day of Prayer. Over the years, Laguna Beach has used this format as an opportunity to honor local individuals who have respected and assisted in the well-being of others in our community. The theme this year is “Love One Another.” Join the Laguna Beach Interfaith Council in honoring Waymakers Laguna Beach Youth Shelter’s Program Director Carol Carlson and Program Director and Laguna Beach Net-works Pastor Don Sciortino. RSVP to Ann Jones at asloanj@aol.com by April 20. Mission Hospital is located at 31872 Coast Hwy. The Susi Q Center is proud to host a free Men’s Support Group every Friday from 11 a.m. - 12:30 p.m. Men over 50 will have an opportunity to receive support with the general stress of everyday living, as well as other issues affecting one’s well-being. Issues that might be discussed during the group include: work; career; retirement; relationships; being a grandparent; grief and loss; aging and personal and social expectations of males in our society. This is an open group and drop-ins are welcome. For more details, contact group facilitator Clint Christie, LMFT at (949) 715-8104. The Susi Q Senior Center is located at 380 Third St.
Saint Catherine of Siena School is offering a New Family Scholarship in order to provide all families in the Laguna area with the opportunity to attend a Catholic School. The scholarship deadline is April 30, 2019. Saint Catherine of Siena Parish School is a small, close-knit, friendly community that offers a rigorous academic program in a faith-based environment. From Transitional Kindergarten to a high school preparatory Middle School, Saint Catherine offers a unique atmosphere where small class sizes allow students to shine. --Additional students in family will receive $3,000 off of tuition. New families may also qualify for the Tuition Assistance Program. For more information and to apply, visit www.stcathschool.org or call (949) 494-7339. For additional questions, email stacathschool@stcathschool.org. Saint Catherine of Siena Parish School is located at 30516 South Coast Hwy. Boys & Girls Club of Laguna Beach is proud to present its 19th Annual Art of Giving Gala, “Under the Sea,” on Saturday, May 11, at Montage Laguna Beach. This is an event you will not want to miss. It is a chance for every female to express her inner Mermaid, and every guy to get just as decked out as the ladies. Guests will start the evening on the Montage lawn with tasty morsels and signature cocktails. The evening will continue with an elegant dinner and rousing live auction followed by dancing to some live music. The event will raise funds to help the Club reach more young people and to instill integrity, compassion, and respect in them. This promises to be the event of the year, and a chance to generously support the Club and its 4,000 youth and families. Proceeds raised at the 19th annual Art of Giving Gala go directly towards empowering children of all ages to reach their full potential, no matter their financial situation. So mark your calendars and join the Boys & Girls Club of Laguna Beach for a good time at the 19th Annual Art of Giving Gala. Table sponsorships are available. For more information about the Gala, contact Michelle Fortezzo at (949) 715-7584, michellef@bgclaguna.org, or visit the Club website at www.bgclagunabeach.org. 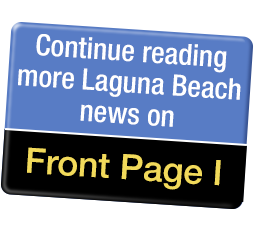 The next Regular Meeting of the Laguna Beach Unified School District Board of Education is Tuesday, March 12 at 6 p.m. at the LBUSD Office Board Room, located at 550 Blumont St, Laguna Beach. LBUSD provides full video streaming of its board meetings online. Public comments may be given for items both on and off the agenda by filling out a blue public comment form. Forms and form rules are made available at each meeting. Archived videos may be accessed at: www.lbusd.org/page.cfm?p=981. If you have difficulty accessing the videos, emaisl info@lbusd.org.